Just reduced by $1, 750, 000. Agent will provide seller form Purchase and Sale Agreement upon request. 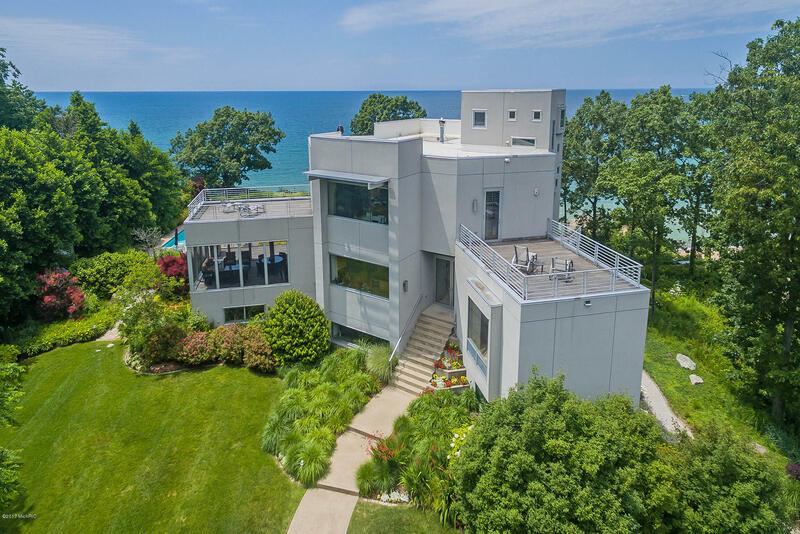 A contemporary architectural masterpiece with 240' of Lake Michigan unbelievable beach frontage on 5+ acres of woods and magnificent gardens -- stunning panoramic views (180 degrees) of the lake, North and South 20+ miles on a clear day, and a view of a canyon that looks like the Badlands of South Dakota. This 5 bedroom 5-1/2 bath 6, 000+ square foot home is located in the private, gated Pinnaclescommunity of 45 +/- acres where six custom homes own their individual lots and the remainder is owned by the Association.